Published: April 27, 2015 at 07:06 p.m. Updated: April 27, 2015 at 08:28 p.m.
Greg Genske has been an agent for 12 years, and he was a trial lawyer before that. But the run-up to the 2015 NFL Draft, which finally starts Thursday, has been a shock even to him. "I've never seen anything like it, truthfully," Genske said in a recent interview. "I thought driving around with Manny Ramirez in Boston was kind of crazy. Every day with Jameis is like that." Jameis, of course, is Jameis Winston, the former Florida State quarterback and Heisman Trophy winner whose name is expected to be the first called by Commissioner Roger Goodell in Chicago, when the Tampa Bay Buccaneers make their pick. Winston is Genske's client -- Genske is more well-known as a baseball agent -- and he's arguably the most polarizing player ever projected as the first overall choice, because he both possesses tantalizing talent and is trailed by a string of off-the-field incidents that includes, most troublingly, an accusation of sexual assault while he was at Florida State. Winston was never charged in that incident. He sought a meeting with Goodell because, Genske said, Winston approached preparing for the draft as if he were interviewing for a job. The league also wanted Winston to know where it stood, said those familiar with the meeting: The NFL hopes Winston is successful, but it will be fine with or without him. The vetting of Winston by the Bucs -- general manager Jason Licht told the Tampa Tribune that the team has spoken to upwards of 75 people, everyone from friends to members of the state attorney's office, but not to Winston's accuser, who filed a civil suit against him earlier this month -- has become a storyline this spring, provoking others to reveal the depth to which teams go to inoculate themselves against disaster. Former Bucs general manager Mark Dominik admitted recently that before the 2012 NFL Draft, he sent a scout to hang out at a bar near the Oklahoma State campus for a week to see how often receiver Justin Blackmon showed up. The answer was not good, and Blackmon, who is now serving a suspension for violations of the league's substance abuse policy, was removed from the Bucs' board. Winston, though, remains very much on the Bucs' board. "We're very confident in the amount of work we have done," Licht said in a press conference last week. "Maybe 25 years from now I'll write a book, but we feel very confident in the amount of work we've done internally. We have had work done externally, third parties, on and on and on. So there have been no surprises." Winston's standing is as firm as it is undoubtedly in part because this is a poor class at the game's most important position, and he is considered more immediately NFL-ready than his counterpart from Oregon, Marcus Mariota. The depth of the Bucs' need to be right with this pick is obvious. Since their inception in 1976 -- 39 years ago -- they've had 36 different starting quarterbacks, 23 of whom were drafted by them. They are the only NFL franchise to never have a quarterback make at least 80 starts for the team. Winston threw 18 interceptions last season, a statistic that gives some NFL personnel executives pause. But while Mariota has no off-the-field red flags to overcome and threw just 14 interceptions total in his three college seasons, he does have to convince teams he can transition from the Ducks' offense, which did not ask him to regularly huddle or decipher a defense, to a more typical NFL one. 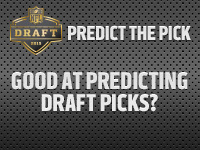 It is possible that Winston and Mariota are the only two quarterbacks taken in the first round. But the long-standing anticipation for Winston to go to the Bucs -- Licht first said there was a leader in the clubhouse for their pick at the NFL Scouting Combine back in February -- has not removed all drama from the first round. Tennessee, with the second overall pick, will be a pivot point because of interest in Mariota. The Titans have professed their affection for their own Zach Mettenberger, and if that holds true and they pass on Mariota or indicate a willingness to trade out of the spot, the scrambling will begin in earnest by teams desperate to grab the 2014 Heisman Trophy winner. While this class, like the 2014 group, is rich with wide receiver talent, it might also represent a renaissance for a position that has frequently been an afterthought in recent years. With Todd Gurley and Melvin Gordon as the headliners, this is viewed as a very good running back group. A running back was taken in the first round of every draft from 1964 to 2012. But none were taken in the first round in 2013 and 2014, two of only three years in draft history in which that happened (1963 was the other). Gurley and Gordon could break the most recent trend this year. Ultimately, though, this draft might be remembered for beginning a trend that doesn't have anything to do with what happens on the field. 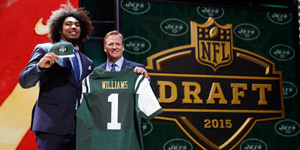 It is the first time the draft will be held outside of New York after 50 straight years in the Big Apple, and it is almost certainly the beginning of an extended road show for the NFL's second most popular event. Teams this year should only hope that this Chicago draft is as successful as the last one, held in 1964, in which 10 future Hall of Fame players were selected -- a record that still stands.